Moving locally within the Romsey area? Moving to Romsey? We can help! We are a local removal company, and have helped people to move to all areas around Romsey including North Baddesely, Southampton, Eastleigh, Bitterne Park, Winchester, Totton, Eling, Golden Common and Stockbridge. Schepens is one of the most experienced removals companies in the area. We transport thousands of tons of furniture each year. The large scale of our operation helps us achieve excellent efficiencies. It also helps us negotiate great discounts with our suppliers. These savings are passed onto our clients, making us one of the most affordable Hampshire removals companies. We have gathered a team of removers who are hard-working, dedicated, and very professional. They are also trained to the very high standards outlined by the British Association of Removers. These standards cover everything from the packing materials used to the contingency plans that must be in place for each removal. Our adherence to BAR standards helps to ensure our Romsey removals are performed professionally. Schepens is a very busy Hampshire removals company. We often perform furniture removals to Romsey and other parts of Hampshire. This has allowed us to develop excellent knowledge of the local area — improving the efficiency and reliability of our removals service. All of our Romsey removals are performed using specialised vehicles from our fleet. Each vehicle is fitted with air ride suspension, an adjustable barring system, and security alarms to improve the safety of your removal. Our removals vehicles are only driven by trained professionals. Our family-owned company has been performing removals for Hampshire for over 100 years. Over that time, we have developed a reputation for providing reliable, efficient, and safe Romsey removals. We are also able to provide safe, secure and clean storage within easy reach of Romsey on a short or long term basis. North Baddesely, Southampton, Eastleigh, Bitterne Park, Winchester, Totton, Eling, Golden Common and Stockbridge. 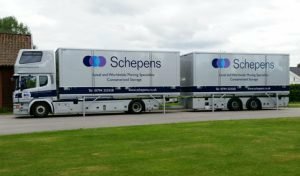 If you need a removals company in Romsey, then Schepens has the experience, expertise and local knowledge to offer you a smooth, trouble-free move. Romsey is a small town located in the shire county of Hampshire. It is situated in one of the most beautiful parts of the UK, with pristine forests and rolling green hills. Romsey has become a popular destination to move to because of its quickly growing economy, strong community, and high standard of living. 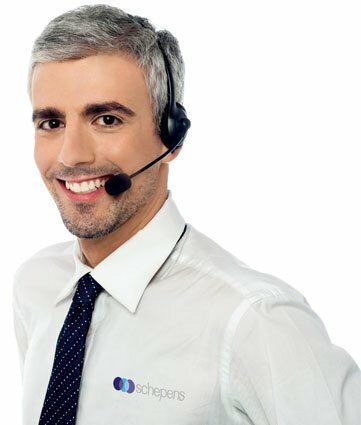 If you are relocating to Romsey this year, use a professional Hampshire removals company like Schepens. We perform many removals to Romsey each year and know this part of the UK well. All Schepens furniture removals to Romsey are managed by a talented move coordinator. They are experienced removers with the people skills, knowledge, and training necessary to ensure our Romsey removals are performed professionally. Your move coordinator will oversee all aspects of the removal, ensuring that your cargo is moved efficiently and safely. They will also be available to answer any questions that you have and provide useful advice on life in Romsey. This guide will take a closer look at Romsey and explain why so many people are moving to this incredible little town. We will also explain why Schepens is the best choice for furniture removals to Romsey. Although Romsey is a small town, it is very prosperous. There are many successful local industries and small businesses. The unemployment rate is low and it is an excellent place to start a new business. Romsey is surrounded by many larger cities including Southampton, Winchester, New Forest, and Bournemouth. It is simple to travel to these locations thanks to regular train services. Residents of Romsey can easily pop over to Bournemouth for a swim at the beach or duck into Winchester for a little shopping. Romsey is situated in a stunning part of the UK, with many waterways, forests, and wetlands to enjoy. There are many excellent trails to hike in the area and some incredible views to enjoy. The residents of Romsey are incredibly friendly and the community is tight-knit. There are regular cultural and community events held in the town, ranging from food fairs to concerts and markets. Despite Romsey having a high standard of living, accommodation remains affordable. You can purchase a flat for around £225k, with terraced properties selling for an average of £288k. Detached dwellings are a bit rarer, which is why they usually sell around £480k. SCHEPENS HAVE BEEN PERFORMING FURNITURE REMOVALS IN ROMSEY FOR DECADES! WE HAVE THE LOCAL KNOWLEDGE, EXPERIENCE, AND SKILLS REQUIRED TO MAKE YOUR MOVE SIMPLE AND STRESS-FREE! CONTACT US TODAY ON 01794 323558 TO GET A FREE, NO-OBLIGATION QUOTE.